Marvel's Daredevil finally debuted last Friday to much acclaim from fans and critics alike. Though, the random sourpuss did call it a 2 hour movie stretched to 13. Marvel is no doubt looking at some of the criticism, as they continue to shoot their next big series for Netflix. Marvel's A.K.A. Jessica Jones is set to debut later this year, and will continue the adventures of the Hell's Kitchen Avengers, otherwise known as The Defenders. While we've seen plenty of lead actress Krysten Ritter on set as Jessica Jones, today brings our first look at her two main co-stars as shooting continues on location in New York. 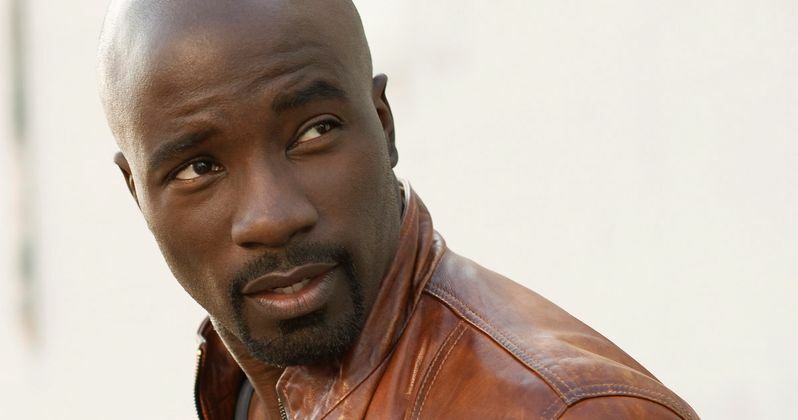 Mike Colter is set to introduce his Luke Cage in Marvel's A.K.A. Jessica Jones first, before moving onto his own Netflix series, which will debut sometime in 2016. In the latest set photos, we get to see him riding his motorcycle with Krysten Ritter on the back. The series won't be so gritty as to see him not wear a helmet. And maybe even more exciting for fans, at least for all you Doctor Who fanatics, is a first glimpse at David Tennant as the villainous Kilgrave. He is seen here squaring off with Krysten Ritter. As well, we get to see him in his fancy lavender suit, a direct nod to his villain name: The Purple Man!